Witnesses told the Reuters news agency the boat was struck by shells fired by Houthi rebels as it left the al-Tawahi district for al-Buraiqa in the west. The Houthis have been battling southern militiamen for control of al-Tawahi. Earlier, rebel sources said at least 34 civilians were killed in Saudi-led coalition air strikes in north Yemen. Warplanes reportedly targeted more than 30 locations in the provinces of Saada and Hajjah. The coalition had vowed to respond to a cross-border attack on the Saudi border town of Najran on Tuesday, which left three people dead. Meanwhile, US Secretary of State John Kerry expressed concern about the worsening humanitarian situation in Yemen, as 22 international aid agencies warned that fuel shortages might halt their work. In Aden, there was fierce fighting overnight between militiamen loyal to exiled President Abdrabbuh Mansour Hadi and Houthi fighters, backed by allied security personnel. Residents and militiamen told Reuters that at least 40 people were killed as a rebel offensive on al-Tawahi was repelled with the help of Saudi-led air strikes. Among the fatalities was Gen Ali Nasser Hadi, who was appointed in March by the president to lead loyalist forces in the southern provinces of Aden, Abyan and Lahj. 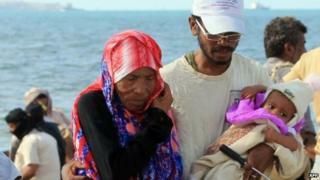 It was later on Wednesday that a barge carrying people trying to flee the fighting in al-Tawahi was hit by shells as it left a small fishing harbour in the Gulf of Aden. Medics and witnesses said Houthis fired the shells, and the pro-Hadi Popular Resistance Committees accused the rebels of a "massacre". The coalition air campaign, which seeks to restore Mr Hadi's "legitimate government", has so far failed to stop the Houthis' assault on Aden. The president took refuge in city in February after fleeing the capital, Sanaa, where he had been held under house arrest by the rebels. When the Houthis reached the outskirts of Aden at the end of March, he left the country for Saudi Arabia. Since then, at least 646 civilians have been killed, according to the UN. The latest fighting comes ahead of a visit to Riyadh by the US secretary of state. Mr Kerry told a news conference in Djibouti that he would discuss ways to implement a "humanitarian pause" in Yemen to allow deliveries of aid. On Wednesday morning, a joint statement by 22 aid agencies called for an immediate end to the conflict and warned that their work risked coming to an abrupt end within a week unless land, sea and air routes to Yemen were opened immediately for the importation of fuel. The fuel shortage has meant entire communities have no access to clean water, while medical facilities have been forced to close or halt even basic services. "Millions of lives are at risk, in particular children, and soon we will not be able to respond," said Edward Santiago, country director for Save the Children. The lack of fuel is also hindering food deliveries in a country where about 20 million people, or 80% of the population, are estimated to be going hungry.